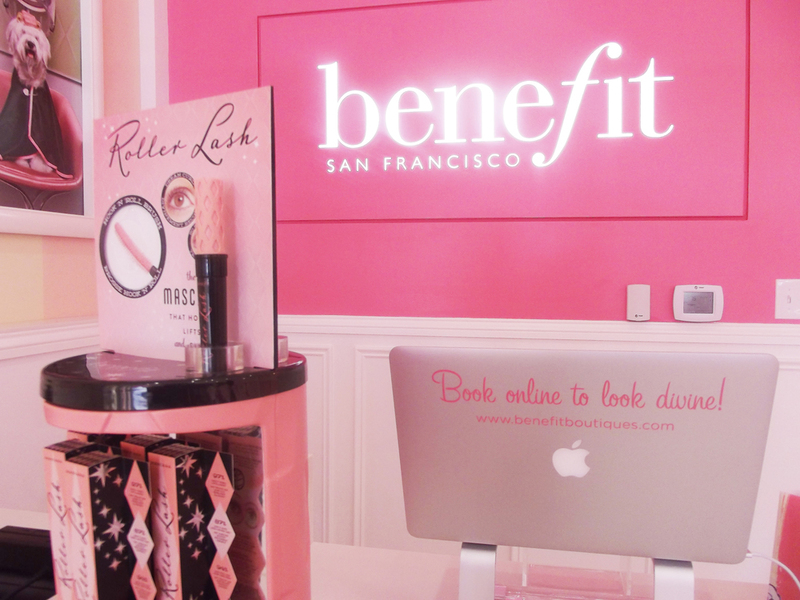 If you're not familiar with Benefit, it's a San Franciscro-based prestige cosmetics brand mainly carried in specialty retailers like Sephora and Ulta. However, if you've visited any airports lately, you may have even seen their kiosks for the jet-setting beauty -- kind of like buying makeup from a vending machine. I saw one of these on my last trip to El Paso and thought it was the cutest concept! Obviously I'm a huge beauty buff, but I actually never knew that Benefit Boutiques existed until I heard about the Preston location in the works. The Dallas flagship is the first in the entire Southern region, so this is a really huge deal..and it's in a fabulous location! Benefit Boutiques offer brow wax and tints, airbrush tanning, and bikini waxing. You can even gather some of your closest girlfriends and have the entire Boutique to yourselves for parties! This would be a great venue for a girls' night. I love that everyone is so friendly here and really help to bring the Benefit Cosmetics image and culture to life! 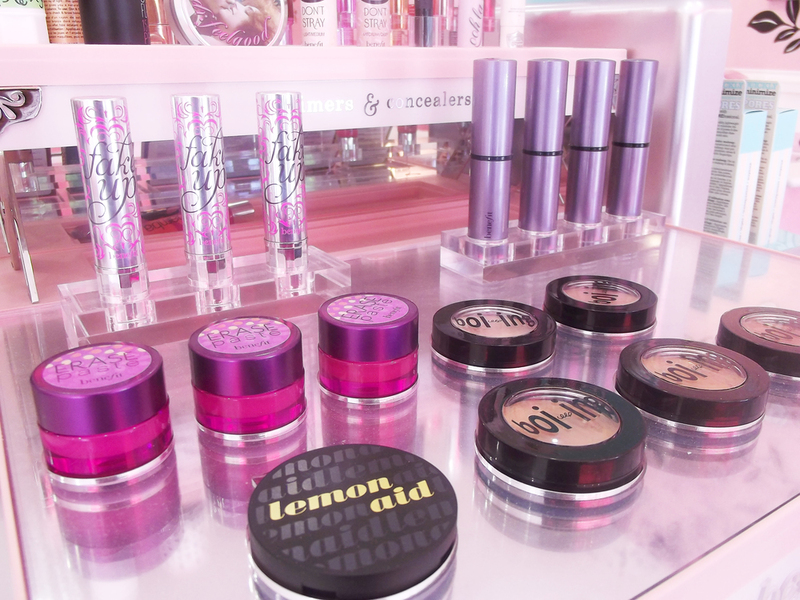 This part of the store is where you can find your favorite Benefit mascara and skincare products. I loved the Bad Gal Lash when I was working at Sephora, but I've been dying to try the new Roller Lash! This is overview of the boutique. There are stations set up all over the store for different services offered and different product types! Benefit concealers are amazing and they have quite a few formulas to try. I practically rushed out to purchase Fake-Up when it came out and it was in my makeup back for a LONG time! I love the way their retail products are merchandised. That's definitely the merchandising student in me talking, but the entire store really embodies that vintage cosmetics look that is on every package! This is where all of the magic happens! 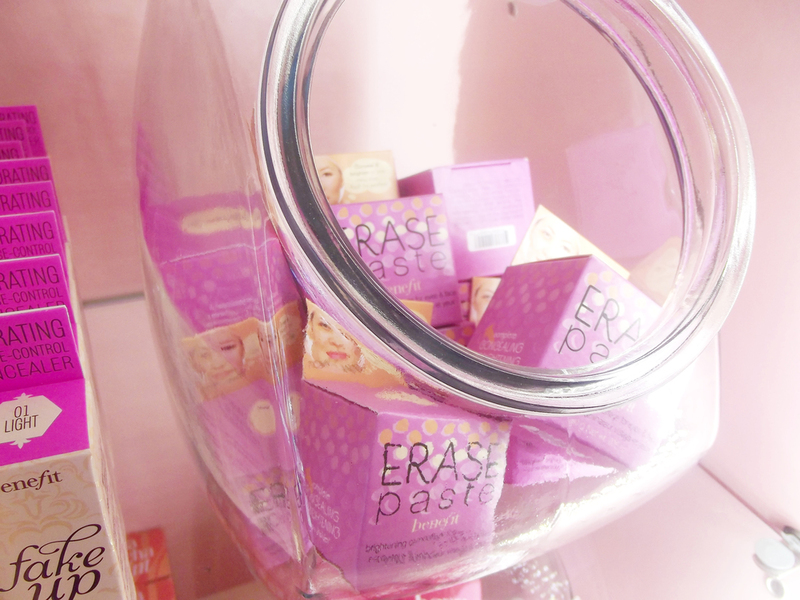 These bars are equipped with everything the amazing Benefit experts need to beautify you. I love the old school beauty chairs! You can sign-in, make appointments, and checkout right here! And maybe make a last minute purchase...or two. I didn't get any services done this time, but it's on my to-do list for when my semester settles down a bite. If you're in the area, stop by and treat yourself to a brow wax and Sprinkles cupcakes. It took me all the discipline in the world to not go completely splurge on cupcakes! I'll definitely be keeping you updated on future events happening at the Benefit Boutique soon that you can attend, so be sure to follow The Fashion Geek on social media!